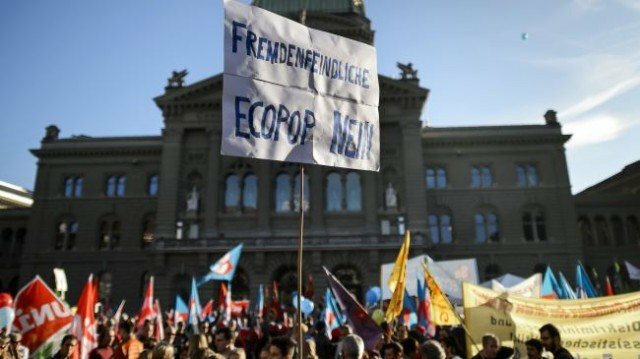 The Swiss voters have decisively rejected the Ecopop proposal to cut net immigration to no more than 0.2% of the population. Switzerland’s 26 cantons rejected the proposal, with about 74% of people voting No in Sunday’s referendum. Supporters of the measure argued that it would have reduced pressure on Switzerland’s resources. Opponents said it would have been bad for the economy. Switzerland voted in February to re-introduce immigration quotas, in effect opting out of an EU free movement agreement. Two other referendums were also being held on November: one on forcing the central bank to boost its gold reserves and one on scrapping a tax perk for wealthy foreigners. Opponents, among them all the major political parties, argued that the proposals would be bad for the economy because business leaders wanted to be able to recruit skilled labor from across Europe. Switzerland’s population is about 8.18 million – of whom 1.96 million are not Swiss nationals, according to the Swiss Federal Statistical Office (FSO). EU citizens make up the vast majority of immigrants. The largest group of foreign nationals living in Switzerland is Italians; immigration from Italy started more than one hundred years ago, but difficulties getting Swiss nationality meant many families remained Italian.